The wedding ceremony was attended by many renowned faces of the Tamil film fraternity including actor Kamal Haasan. 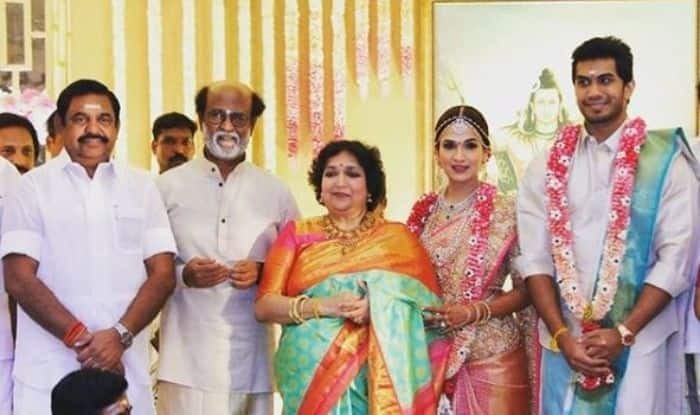 Superstar Rajinikanth’s younger daughter Soundarya Rajinikanth has taken wedding vows with actor-businessman Vishagan Vanangamudi as per south Indian rituals. The ceremony was attended by many renowned faces of the Tamil film fraternity including actor Kamal Haasan. Tamil Nadu chief minister Edappadi K Palaniswami also gave blessing to newlyweds. The pictures doing the rounds on social media prove that it was no less than a fairy tale wedding. Soundarya’s wedding attire was designed by Abu Jani and Sandeep Khosla. She completed her look with a diamond necklace, a kamar bandh and diamond bangles. The bride’s elder sister Aishwaryaa R Dhanush accompanied her to the mandap. Soundarya beamed with happiness and the glow was quite evident on her face. It is being said that the couple will host a grand cocktail party in the evening. She started her career by working as a graphic designer in films like Sandakozhi, Baba and Majaa. Soundarya made her directorial debut with Kochadaiiyaan. She last helmed Dhanush and Kajol starrer Velaiilla Pattadhari 2. She was married to businessman R Ashwin and got divorced after seven years.